Don Tapscott, business strategist, consultant and co-author of Wikinomics will join Andrew Keen, writer, entrepreneur and author of The Cult of the Amateur: how the internet is killing our culture; Dan Hind, editorial director, The Bodley Head and author of The Threat to Reason: how the enlightenment was hijacked and how we can reclaim it; Professor Lord Eatwell, economist and President, Queens College, Cambridge. They will explore different issues which question, to what extent has the global economic crisis triggered a crisis of confidence in our previously trusted repositories of knowledge? They will explore themes such as transparent cultures of collaboration (the wikinomics model), the democratisation of knowledge and the wisdom of crowds. 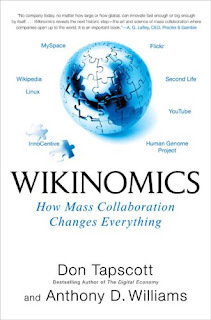 Tapscott and Williams bestselling book "Wikinomics" How Mass Collaboration Changes Everything was voted book of the year (2007) by the Economist and Financial Times. The book reviews how the internet connects people through global platfroms via blogs, wikis and chatrooms to encourage mass collboration.